In the old days Greens often made it seem that they were different from the other mainstream parties in taking the higher moral ground. This particular piece of clothing now seems to have large holes in it. There are many examples of this, but the statement by Adam Bandt on Q&A that the Greens would be happy to form a partnership in government with Labor is perhaps the most relevant for this campaign. This certainly proves that the Greens have moved into mainstream politics. 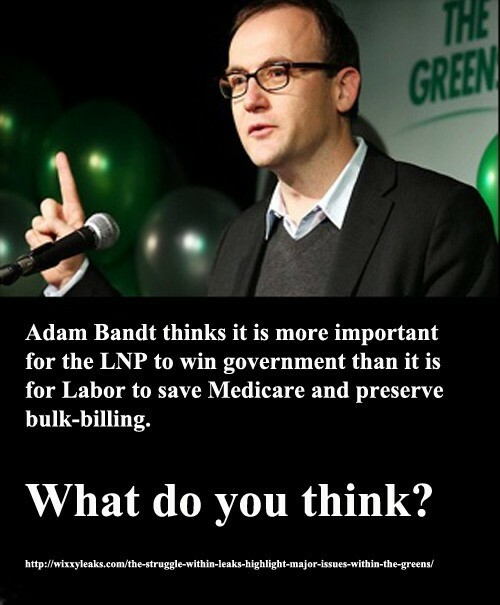 Adam Bandt and the Greens have the right to say and do whatever they wish, however ordinary Australians who vote in elections might not have the same priorities. “Bandt in his support of this view (that an LNP government is preferable to Labor in government) is basically telling the electorate he would rather see Abbott’s sick tax and the dismantling of Medicare than increased funding for hospitals and the protection and expansion of Medicare services. The question "Which Side Are You On?" is not a party-political question. I have not always voted for Labor. In the last election I voted for the Greens in the Senate to support Sarah Hanson-Young. I also fully support the Greens' opposition to the TPP. But this does not mean I will be voting for the Greens this time. There are many, many policies in politics. I don't vote for a party just because I agree with some of its policies. Voting for a political party is not like choosing a rug to fit into your colour scheme at home. It is more important to have a roof over your head than having a rug to match your furniture. In the same way, some issues in politics are more important than others. Labor's pledges to keep Medicare, continue bulk-billing, put more cash into schools and not give big business $50 billion in tax cuts are THE ISSUES IN THIS ELECTION. The Liberals have hated Medicare since its inception. They have waited for more than 40 years to kill it off, and now they are ready to do just that. ARE YOU LOOKING FOR THE PERFECT POLITICAL PARTY? Labor has a terrible refugee policy and they will not even stand up for minimum wage legislation. They are far from a perfect party. But in the real world there are no perfect political parties and there never will be. When we buy a computer, we don't buy a perfect computer. We buy the best computer we can afford at the time. When we vote, we shouldn't vote for the perfect party, or the perfect candidate, or even for the party that thinks just like we do. Most Australians need Medicare and bulk-billing, so they should vote for Labor this time around. Even if you don't need Medicare and bulk-billing, you might think for a moment about the welfare of your fellow Australians who do. How can anyone who earns less than $80,000 per year agree with tax cuts for those earning more money than that AND support cuts to health, education and pensions? PUT THE LNP LAST - THAT IS WHERE THEY PUT YOU! In this election we face a serious choice. The LNP under Abbott got on using lies. Tony the workers' friend said they would not cut all the things they actually planned to cut. This time we know the LNP game. Tax cuts for people who don't need them funded by taking services away from people who do need them. And they have not finished yet. There is more to come!